Littleton, a city in Massachusetts, approved the plan to sell ad space on police cars. 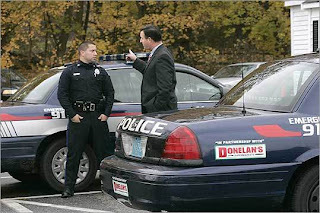 Boston Globe: "Continuing advertisers' march into seemingly every available public space, this small city north of Boston is preparing a plan to allow its police cars to carry up to three advertising signs, each roughly twice the size of a bumper sticker. And the ads would not end there: Fire Department command vehicles may also sport them. A local supermarket and car dealership signed on, and two cruisers have sported the ads. The program has generated $72,000 and is up for renewal in May." Police will not give preferential treatment to corporate sponsors.